The Lawmate Miniature DVR with 720p HD Camera is a great addition to our line of premium Lawmate products! 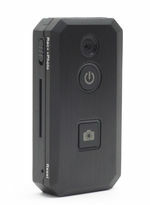 The small size, built in camera, and easy two button operation mean that you are ready to record whenever and wherever. The included wired remote simplifies things even more, allowing you to turn on the device and immediately start recording with a single flip of a switch. It could not be easier! The built in camera makes it easy to record high quality video in a small size. The mounting clip allows you to attach it to almost anything, so you can even use it as a sports camera or as a car camera. Dimensions: Only 2.89" x 1.54" x 0.59"